Pancakes and waffles are common breakfast foods. While it is easy to distinguish a pancake from a waffle, can you distinguish pancake batter from waffle batter? Let’s learn the differences between the two in this article. After the ingredients are combined, the pancake batter is poured onto a hot griddle or frying pan in small rounds. Once one side of a pancake is golden brown, it is flipped and the other side cooks until it’s golden brown. Pancake batter is simple to make. It has a thin consistency and the cooked pancakes are soft but slightly crispy and textured on the inside. Often the waffle batter is prepared by mixing the dry ingredients together then combining all the wet ingredients except the egg whites. The egg whites are then whipped before folding into the batter and everything is combined. This gives the batter a foamy consistency. The batter is then cooked in a waffle iron, which is set up like two hot plates with indents in them. The batter is poured into one side and the other is lowered on top, cooking the batter and giving the waffle a unique shape and surface impression. Cooked waffles are golden and crisp on the outside and have a light, airy texture inside. So what is the difference between pancake and waffle batter? They are similar, but there are still key differences in their ingredients, nutritional value, preparation, and method of cooking. The ingredients of pancake and waffle batter are almost the same but they have different ratios. Typically waffle batter has more butter or oil than pancake batter. Sometimes waffle batter has vanilla extract as well. 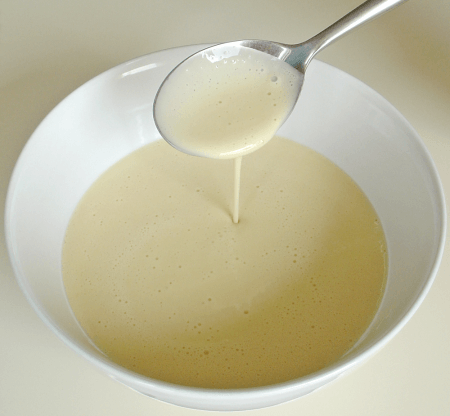 In pancake batter, there typically isn’t a special order or process for mixing the ingredients. Waffle batter, however, sometimes has a step where egg whites are whipped before being added to the mixture. Waffles (and, consequently, their batter) contain more calories, total fat, cholesterol, carbohydrates, and protein than pancakes (and their batter) do. This is because waffle batter contains more butter or oil than pancake batter. 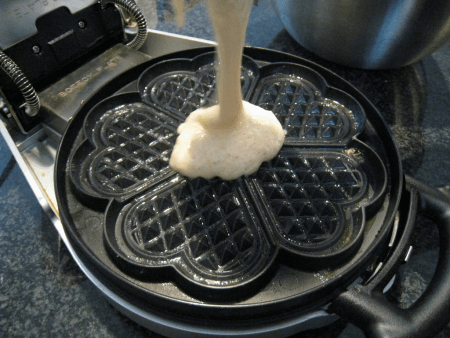 Pancake batter is poured into small rounds onto a hot, oiled griddle or frying pan. Each pancake is turned once so both sides get crisp. Waffle batter, on the other hand, is cooked in a preheated waffle iron.